The Bajaj V brand is one of the greatest marketing ideas the Indian automobile sector has ever seen. 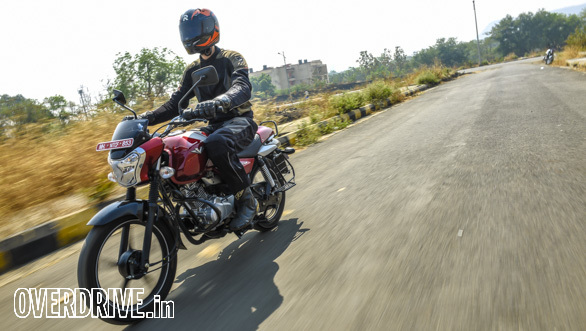 By tapping into our sense of patriotism, Bajaj turned the quirky but likeable V15 into a raging success with over two lakh bikes sold since sales began in Feb 2016. But there's always room for more in India, and Bajaj noticed some 125cc-biased markets weren't lapping up the V15 quite as quick. The result is the V12, a motorcycle that wears the same unique design, a smaller 125cc heart and the promise of a similar riding experience. At first glance, the V12 looks identical to the V15 but there are some small changes. The design of the side stripe is slightly different, and the front mudguard is black instead of body coloured. 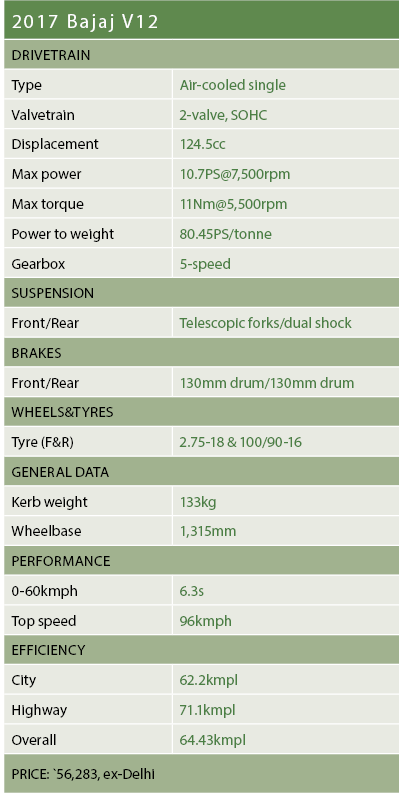 The front forks are 3mm smaller in diameter at 30mm and alloy wheels are new, slightly lighter units. 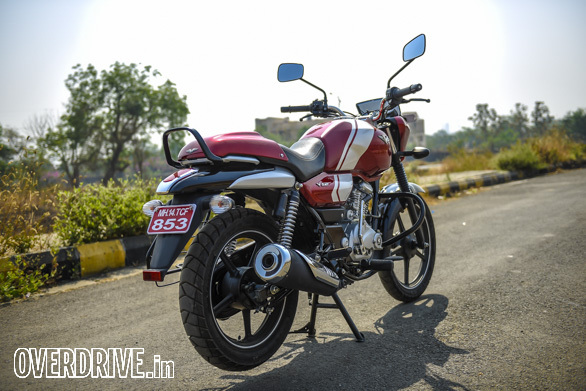 The tyres are thinner as well, but Bajaj points out that they are still the fattest in the segment. Finally, the instrument cluster drops the V15's digital fuel gauge for a more cost effective analogue needle. As with the V15, build quality is quite good and nothing sticks out. Bajaj could have cut costs by using the 124.6cc mill from the Discover, but instead they designed a new engine for the V12. This BS-IV compliant motor has a longer stroke than the square Discover (52x58.6mm vs 54x54.4mm) and it runs a slightly lower compression ratio of 9.8:1. The result is 0.3PS less power at 10.7PS but torque goes up by 0.2Nm for a total of 11Nm that peaks at the same 5,500rpm. Bajaj says the V brand is all about torque and rideability, so the development of a longer stroke motor makes sense. 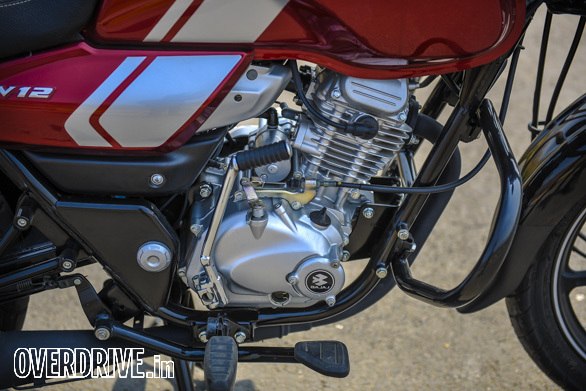 The rest is your typical 125cc fare - air cooling and a simple 2-valve SOHC head. 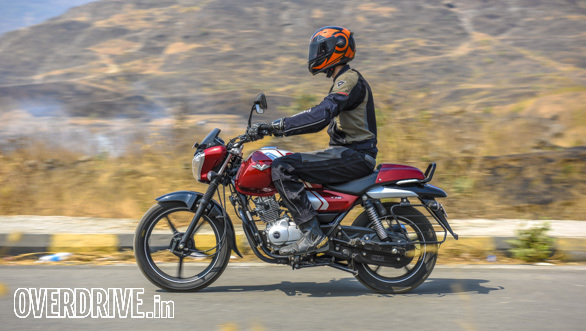 Bajaj has done a great job with the motor  it's smooth, refined and equally happy pottering around in fifth gear at 35kmph or sitting at high revs on the highway. The 5-speed gearbox offers decently smooth and precise shifts and allows a comfortable 80kmph highway cruise. 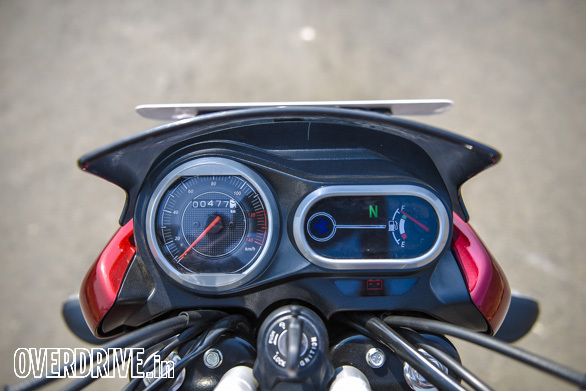 Vibrations do creep in at higher speeds but top-end performance is impressive for a motorcycle of this category, and I managed to see about 103kmph on the speedo with the Vbox reading out 96kmph. 0-60kmph takes a brisk 6.3s and fuel efficiency is good too  the V12 returning 62.2kmpl in the city and 71.1kmpl on the highway. Ride quality is supple and absorptive and doesn't feel too soft or threaten to bottom out. Coupled with a neutral seating position, the V12 is a very comfortable motorcycle to commute on. At 133kg, the V12 is considerably heavier than its rivals but masks its weight well on the move. Bajaj also points out that the big number will appeal to traditional buyers who equate more weight with better stability, a common but not entirely correct analogy. MRF Kurve tyres replace the V15's Ceats and the V12 is better for it as the MRFs offer better grip and feel. 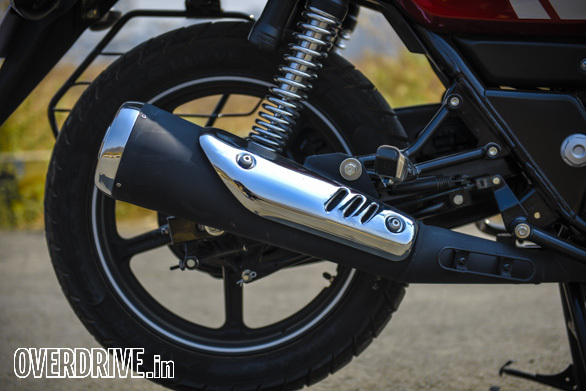 As of now, the tyres are tubed but Bajaj says an upgrade to tubeless tyres is in the offing. Handling is decent; the bike drops into corners quite quickly but is fairly stable when leaned over without any strange or unexpected behaviour. As I see it, the only downside to the V12 experience is in the weak front drum brake. Strong braking demands a very firm pull on the lever which comes nearly all the way to the bar. A disc brake is sorely missed. It will be optional soon and we suggest waiting till that happens. At Rs 56,283, the V12 is priced on the higher side of the 125cc category but it is clearly one of the nicest bikes in the segment. Aside from the pride of ownership factor, the V12 offers good comfort, an enjoyable engine and standout looks. Well worth considering.